This photo was taken at Chengyang Wind and Rain Bridge, near Sanjiang 三江 in Northern Guangxi Province. 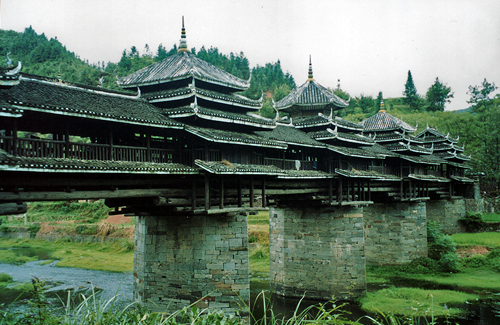 It is one of the best examples of a Dong Minority Wind and Rain Bridge. Built in 1912, it’s 64 meters long and reported not to have a single nail. This photo was taken after scrambling up a steep path to find an ideal spot to get an overview of the bridge. A pity about the crappy camara I had at the time. The area around Chengyang Bridge is stunning. Beautiful Dong Minority villages are set amongst electric green paddy fields. In the lazy meandering rivers, huge water wheels turn slowly as they have done for centuries, tipping water into bamboo irrigation pipes. And above all there is the Chengyang Bridge. Sounds like paradise doesn’t it? 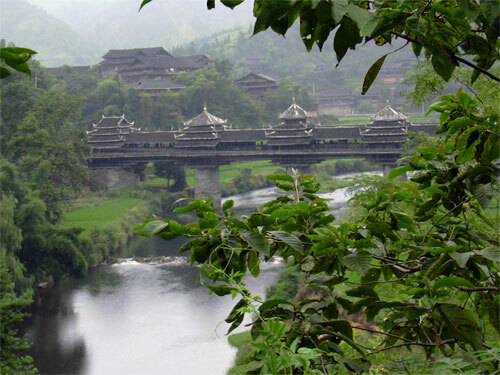 In 2003, the only place to stay near the bridge was the lovely rambling Chengyang Bridge National Hostel, a funky wooden guest house with a great veranda for chilling, reading and knocking back a few beers right next to the Bridge. Unfortunately for Margie, it was also home to some of the biggest and fastest moving 8 legged monsters you’ll ever meet. Spiders, big long-legged, hairy spiders scuttling across wooden beams from room to room, hiding behind the bedhead or hovering above you in the shower; Margie’s nightmare; my hassle. Travelling in Northern Guangxi and Guizhou Provinces with an arachnophobic can be quite a testing experience. The old wooden houses in the minority villages provide perfect abodes for these arthropods. And my job, as always, is to make the rooms safe before Margie will go in them. Given the spaces between the wooden slats; an impossible task. Wow, I’m speechless. It’s amazing.